Like a Rooster crows at the first light of sunrise from the East, Tithebarn Export has embraced the first successful overseas trip in the Far East this year, strengthening the bond between our trade and two of the most vibrant ASEAN countries: Indonesia and Vietnam. With over 250 million heads to feed, agriculture plays a vital role of the local economy in Indonesia. Production of poultry for both meat and eggs has been traditionally dominant in the food industry. Growing rapidly to meet local steadily increasing demands, however, is the number of cattle farms for the production of milk and meat. Once reliant on import from Australia for quality beef, local breeders are beginning to make their mark as well as to provide an alternative source. In addition the demand for liquid milk and milk based products such as cheese and yoghurt has grown rapidly. The nation’s newly discovered appetite for dairy food continues to increase which has encouraged the number of dairy farms together with their herds’ sizes to escalate in order to match this demand. 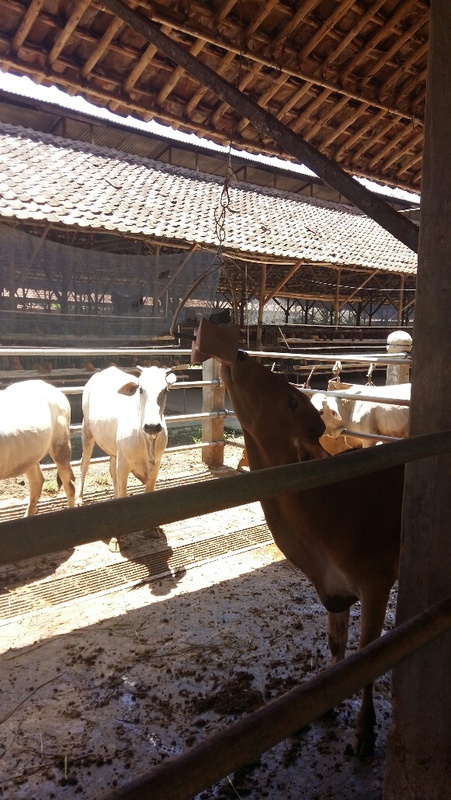 How to improve dairy cattle’s health and productivities has become to be the focus point of Indonesia’s arising dairy industry. With a wide range of products covering most species, Tithebarn is able to offer the local producers quality sources of minerals and vitamins, which will ensure optimum production and growth whilst protecting the health of the livestock and helping the farmer’s profitability. A long established relationship with local distributor P T Ekasapta Wijayatangguh means that Tithebarn can quickly pass on new developments and get key products onto farms as quickly as possible. Following recent restructuring of the distributor’s ownership, our new key marketing objectives have evolved with greater emphasis being placed on the ruminant sector than what has been previously. This new strategy has already expanded sales of the renowned Rockie brand of mineral licks. Local ranch managers, such as Ms Deer, are already convinced of the benefits. For a long time, her cattle were listless and continuously licking or even biting each other in a desperate search for the minerals that were missing in their diet. Within a few short days of starting to use Rockies, the problem stopped completely! Not only did her herd stop the absurd behaviour due to lack of minerals but the cattle have also obtained healthier appetites, which means more efficient feeding consumption and faster growth. This well-earned trust upon Tithebarn products has convinced Ms Deer to try some of Tithebarn’s mineral vitamin premixes for her poultry too. Delighted to say she is now a long established and regular customer. Tithebarn Export is committed to provide ongoing planned sales support and technical training throughout the year. We are looking forward to the exciting development and future growth in an “Inspiring Indonesia”. Whenever you touch down at Ho Chi Mihn and hit the streets, you will almost instantly feel the energy, the vibrancy and the buzz of a city that is alive and eager to make things happen. What better place then, for our local distributor Ruby Trading, who over the period of some 20 years, has seen sales increase from 1 FCL per year to more than 1 FCL per WEEK? Such is their growth and strength in the local dairy sector that Ruby really is the “Jewel in the Crown”. They have become the No.1 sales outlet for Rockies amongst all ASEAN countries. 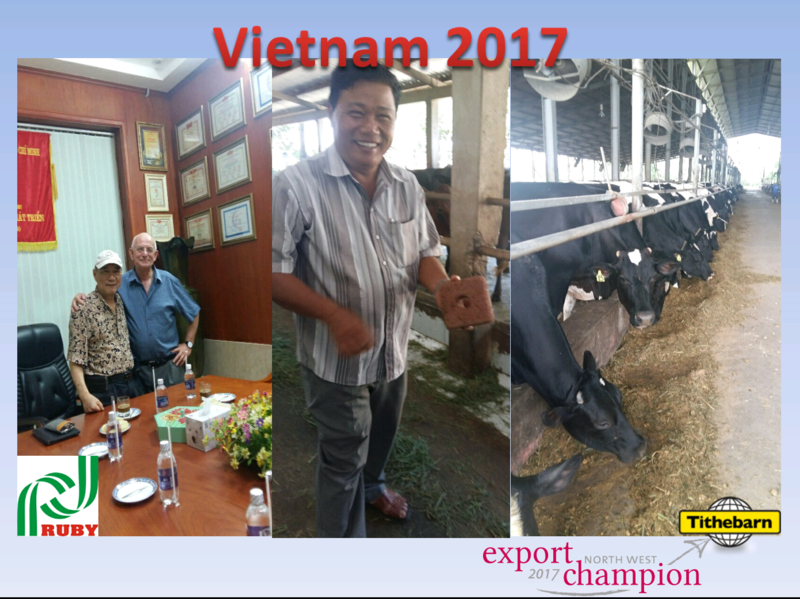 Milk production in Vietnam has grown significantly in recent years and local producers have rapidly gleaned knowledge and experience from the best in Europe and around the world. Whether it be small local family farm or large sized prestigious herd, the dairy farmer is proving time and time again that the use of Red and Phos Rich Rockies is improving milk yields, milk quality, conception rates and overall good health for cattle. A great example of such achievements is the advanced research conducted by a local government farm where the research and evaluation look into genetics, breeding and feeding factors. Rockies have been a consistent part in this research for the cattle’s daily diet. Both Red Rockies and Phos Rich Rockies are used to ensure optimum results in this government sponsored research in Vietnam. Despite some worthy competition from local productions and European imports, Rockies remain the top selling brand of mineral licks in the Vietnamese market supplying 80% plus of the overall demand. Tithebarn Export’s two-country-trip at the beginning of the 2017 has undoubtedly brought us the delight from the East like the first crow of the Year of the Rooster. We strongly believe that the continuous local training to our sales teams and the onsite support to individual farmers are vital to reinforce all Tithebarn’s 60 plus export regions.